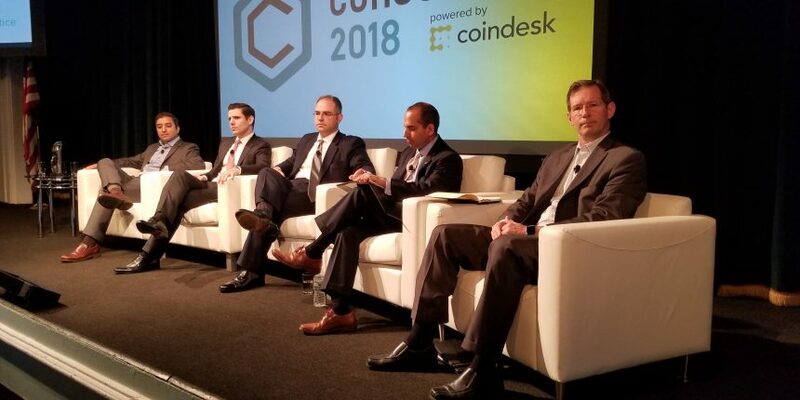 U.S. regulators are still looking into cryptocurrencies and initial coin offerings, but don’t aim to suppress the industry, according to comments made during a panel at CoinDesk’s Consensus 2018 conference in New York. Commodity Futures Trading Commission (CFTC) enforcement director James McDonald, Securities and Exchange Commission (SEC) Enforcement Division Cyber Unit chief Robert Cohen and associate deputy attorney general Sujit Raman participated in a panel discussion on enforcement activities in the space Tuesday. They were joined by Kiran Raj, chief strategy officer at crypto exchange Bittrex, with the panel moderated by attorney Steve Bunnell. The government representatives, who disclaimed that they only spoke for themselves and not their respective agencies, notably all agreed that they did not want to hinder innovation or interfere unduly with blockchain or the tokens built on the nascent technology. That said, they all also stated that they had to act against those seeking to defraud or outright steal from participants in the space. Read the full rundown on Twitter.